There have been quite a few cold-weather troops in the GI Joe ranks over the years, but it all began with one guy. Snow Job was a major Olympic Biathlon contender. He enlisted initially for the special training and support privileges that the army gives to Olympic champions. 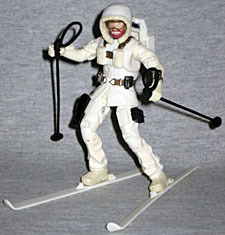 However, to the consternation of Army PR flacks, Snow Job volunteered and was accepted into the GI Joe team! Qualified Expert: all NATO long range sniper rifles, XMLR-3A laser rifle. Considering that the original Snow Job from back in 1983 has basically a solid white lump with a face painted on it, there was a lot of room for improvement. Hasbro obviously recognized that open invitation, and has accepted. They stepped up to the challenge of turning a formless blob into an interesting toy. How did they do? Short answer: good. Long answer: really damn good. 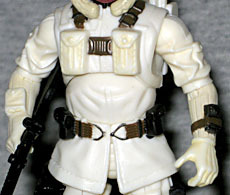 Snow Job is still wearing white gear, but there's a lot more detail all over. The wrinkles of his coat are bigger and deeper, his sleeves look like they're knit, there are zippers on the outside of his pantlegs (so he can get them over his big chunky ski boots) and the pockets on his chest not only have buttons, but sculpted seams. There's a brown harness running over his shoulders, and the lower edge of his coat is held down by a thick belt. He has a big hood, since you lose most of your body heat through your head. This same body was re-used for Wild Weasel, but it looks drastically different. A big part of that change is the hood and skirt, of course, but there's also the paint. His outfit is off-white, and it's broken up by the use of cream on the forearms, pockets, boots and hood. His belts are brown, and he has black pouches around his waist and on his left arm. Generation 1 Snow Job was distinguished by the fact that he was perpetually enveloped in his fur-trimmed hood and black goggles: that's how his head was sculpted, and there was no way around it. Oh, the comics and cartoon showed off his big shock of red hair, but the toy only gave us his beard. This new one technically isn't any better, since his beard is still all we see, but this time his hood and goggles are removable - he's just wearing a white skullcap, for added insulation. In addition to the two bits of cranial accoutrements, Snow Job's accessories include a black pistol, a pair of skis and ski poles, a backpack, and a black rifle. The rifle is the "XMLR-3A laser rifle" mentioned on the filecard, and best known for being the generic gun carried by most of the Joes on the cartoon. Pretty classic! The skis and poles can be stored on the backpack, for the times when Snow Job needs to get up a mountain instead of down. Despite having a plastic "skirt" formed by the lower edge of his coat, Snow Job doesn't lose any articulation. Yes, his hips are somewhat restricted, but not in any significant way: the material is flexible enough that he can raise his legs as far as you'd like, so he looks natural in skiing poses - he just can't sit down. There are two little sculptural easter eggs worth mentioning, and they're both on the figure's legs. 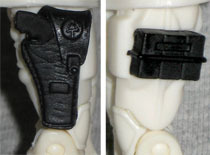 The holster on his right leg actually has a working flap so you can store the revolver in there, but the flap has the logo of the Adventure Team the non-military GI Joes from the '70s. [it was also used near the tail-end of the Sigma 6 line --ed.] On his left leg he has a black box which has a horizontal indent and three vertical compartments. You really have to be old to recognize this as the Pocket Patrol Pack from G1. The PPP was supposedly "a replica of the supply pouches worn by your favorite members of the GI Joe Mobile Strike Force," and sure enough, here's one wearing it. Nerdtastic! Snow Job is a truly excellent update - easily among the best Hasbro's done since they started "Generation 3." The figure looks great, his accessories are fun, and there are clear improvements made to the design, while still retaining that classic feel. 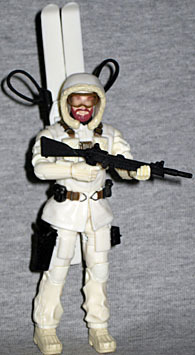 If you're a fan of GI Joe, there's no reason not to add Snow Job to your collection.